Pick up the phone and call 281-704-3696 today for expert Willis AC repair, installation and replacement service. Whole home comfort is just a phone call away. You can take advantage of our current online specials and coupons when you click here now. If there is one home service you don’t want to do without during the stifling Texas summers, it is air conditioning. When the temperatures are soaring, your AC has to work extra hard to maintain a comfortable temperature inside. If your cooling system fails when it’s hot outside, that heat will become trapped inside your house and result in a dangerous situation. Take the time to find a high quality AC expert in Willis, TX, so if your cooling system does break down you will have immediate help on the way. Curious to see what your neighbors think? Click here to find out what others in your area are saying about our services. The filter in your air conditioning unit is designed to catch airborne particles like dust and dirt, so you and your family won’t have to inhale it when it gets into your living space. The filter works well for a few months, but then it will become clogged and make it difficult for the cooled air to get through. When this happens, the AC still tries to reach the temperature you’ve set on your thermostat, but it has to work harder to get there, reducing the overall efficiency and raising your bills. If your air conditioner needs repairs, or it’s time for a replacement, try to avoid any impulses to perform the service yourself. When you try the DIY approach, you may end up making the situation worse or end up with a completely inefficient system. Standard forced air AC systems and ductless systems both produce cool air, but they have several key differences. A standard system blows cool air through ductwork, while a ductless system uses air handlers on the inside and a condenser on the outside, connected by copper tubes. Ductless AC systems have better air quality and are usually more efficient than their forced air counterparts. 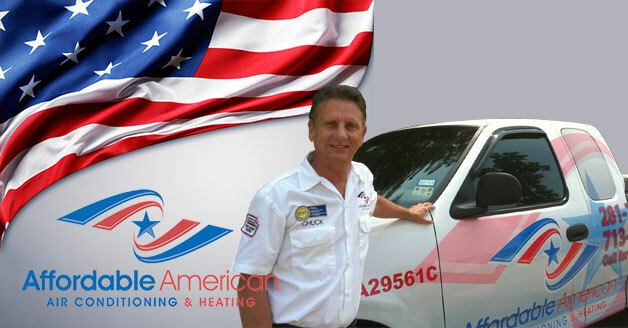 Affordable American Air Conditioning & Heating provides the highest quality AC services in the Willis, TX area. Give us a call at 281-704-3696 today so we can send one of our technicians to your home to assess the situation and find the ideal solution.